An updated and modernized take on a retro shag cut. Piece-y strands, choppy layers and point-cut ends make movement and dimension pop on a darker hair color. 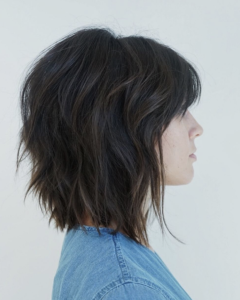 Higher layers in the back of the head, in addition to long, parted bangs both balance each other out, add shape to the head and volume to the cut. The look is finished off with a spritz of L’Oreal Professionnel Next Day Hair for purposefully messy texture.